A R T & D E S I G N b y c a n d a c e b r e k k e : Design Dilemma! First off, I apologize for the quality of the photo. This is a cute little inlet in the corner of the living room. My problem is that I don't quite know what to do with it. Here are some options I have considered. Please share your thoughts, especially if you have another solution! 4. 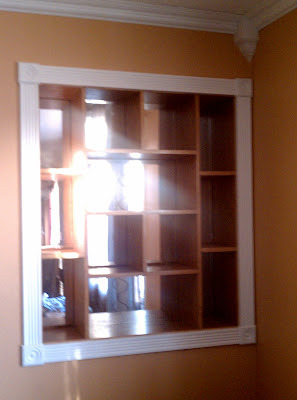 Remove the shelves and the mirrors all together and use it as a regular alcove, possibly tiling the background. I want to make it functional for either photos and accessories, or as a unique focal point to the living room space. I just can't decide!! Help??? Labels: advice, challenge, decor, Design, help? I think either painting everything white or patterned wallpaper with white shelves would look great, esp. if the accessories you showcase provide pops of color! Another options would be to paint the back a solid color that pops, then the shelves white and showcase a collection of similar items if you have them...I remember seeing a photo of a white milk glass collection displayed in the same type of shelving and it looked really clean and modern. ohhhh, my mom has the best collection of orange glassware. Wonder if she would be willing to give it up? Thanks for the suggestion!